A new exhibition at the Peabody Museum of Archaeology and Ethnology traces the development of photography and its use in anthropology from the beginnings of both fields in the 1800s to the present. A Korean woman looks out from the dark of a seller’s stall, her face framed by its wooden supports and a large, neatly stacked pile of apples that dominates the foreground. As the viewer takes in the photograph, an incongruous splash of America appears: Ritz crackers, Chuckles candies, Baby Ruth bars. The woman was captured by the 35 mm Leica camera of Roger Marshutz, a U.S. Army Korean War photographer who spent his off-hours roving Pusan shooting thousands of images. The photograph is among four by Marshutz and dozens by other photographers in a new exhibition at the Peabody Museum of Archaeology and Ethnology. The exhibition, “From Daguerreotype to Digital: Anthropology and Photography,” examines the use of photography in the discipline of anthropology, both of which have roots in the mid-1800s. The exhibition, which opened June 28 with a public reception, was assembled by Lisa Barbash, associate curator of visual anthropology at the Peabody. In an interview, Barbash said the exhibition seeks to link technological developments in photography and its use in anthropology over the decades. Starting with the stiff portraits of daguerreotypes, which captured images on a thin layer of silver on a copper plate, the exhibition moves through the years and includes portraits of American Indians fixed to paper through albumen and salt printing processes, Polaroid prints, 35 mm film, pinhole cameras, and, most recently, digital photography. The exhibition also shows that manipulation of photographic images isn’t something that began with digital photography software. The exhibition includes several hand-painted images where color was added to black-and-white pictures, as well as two images of a tattooed Japanese man showing how the image was not only hand-painted, but extra tattoos were added. Photographic manipulation extends to some of the earliest images, the albumen and salt prints of American Indians whose portraits were taken on a visit to Washington D.C., Barbash said. Before the camera’s shutter snapped, the Indians were handed ceremonial items to use as props. Although not all anthropologists use photography, Barbash said it is a potentially powerful tool to document the ways of a particular people at a particular time and to share information with everyone from colleagues to students to grant-making organizations. In some cases, such as that of an ancient stairway marked by hieroglyphics in the Mayan city of Copan, Honduras, the photographs have been used to reveal mistakes in restoration. An examination of glass-plate photos taken in the 1890s showed that 65 percent of the stairway’s large blocks had been replaced out of order during restoration. 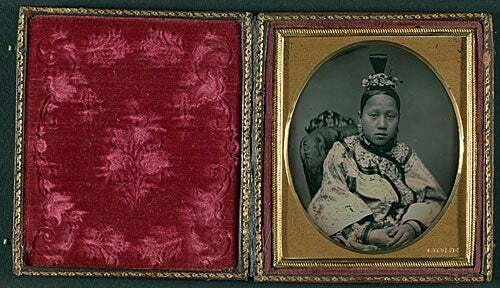 “From Daguerreotype to Digital: Anthropology and Photography,” at the Peabody Museum of Archaeology and Ethnology, 11 Divinity Ave., Cambridge. Shriram Ramanathan's laboratory setup for testing solid-oxide fuel cells. The fuel cell is hidden under the circular component at the top, which pins it down to create a tight seal with the hydrogen fuel entering from below. Two needles connect with the electrodes to measure the electricity produced.